This book, by leading investment analyst David Bassanese, will allow you to discover in 4-easy steps how to reduce the cost and complexity of your investment strategies. ETFs allow you to create your own low cost and and highly diversified investment portfolio – that can include Australian and international shares, bonds, commodities and/or even foreign currencies. You can buy ETFs on the ASX – just like a company share – using your share trading account. Why wait? ETFs are already improving the investment strategies of over 200,000 Australian investors, including many self-managed super funds (SMSFs). 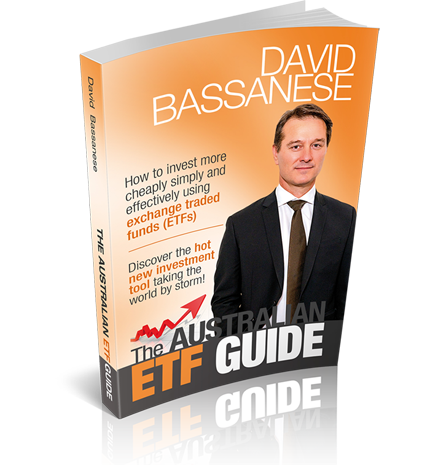 David Bassanese is one of Australia’s leading economic and financial market analysts. He is Chief Economist of BetaShares, one of Australia’s leading managers of exchange traded funds. David is a former columnist with The Australia Financial Review newspaper, interest rates strategist at Macquarie Bank, and economist at the Federal Treasury and OECD. Special bonus: Kindle and iBook compatible ebooks emailed immediately to you at no extra charge , $20 extra value.